ISPITA by LIVIU GRIGORICĂ is a collection. 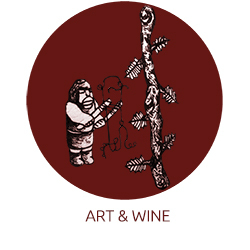 ISPITA is an art-and-wine esoteric codex made of 6 distinct parts/wines. Each letter of the word ISPITA conceals a magic element defining an aspect placed in between the bright side and the tenebrous side of creation. The label-and-box drawings are signed by Ciprian Paleologu, the visual artist who created the concept and the design of this collection, represented by the series of 6 symbol letters. Each wine in the ISPITA collection has its own personality. Oenologist Liviu Grigorică, the author of this collection, creates each wine according to the letter, the symbology and the notion it has acquired. The wines will be issued in a sui-generis rhythm, and after the last letter will be “disclosed”, we’ll launch a limited series of art-and-wine object boxes, “housing” all the 6 bottles/letters/notions put together. Letter I of ISPITA by LIVIU GRIGORICĂ illustrates the Illumination. It’s a red blend containing 5577 serialized glass bottles. Letter P of ISPITA by LIVIU GRIGORICĂ illustrates the Power. It’s a red blend containing 4881 serialized glass bottles. Letter S of ISPITA by LIVIU GRIGORICĂ illustrates the Savor. It’s a red blend containing 5555 serialized glass bottles.